Expressing thanks with a handmade greeting card or beautifully designed gift tag for that special gift is a joy to give, as well as to receive! The wonderful Thank You Sentiments Cling Stamp Set comes filled with not just sentiments of thankful appreciation, but also exquisitely designed cling stamps for both Mother’s and Father’s Day…two days of the year sending a note of thanks is certainly welcomed! 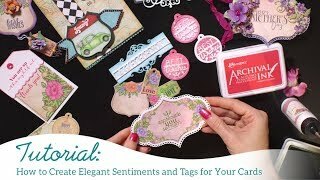 Pretty scripts, bolder printing, and simple line style fonts provide a wide range of options for just the right look on your handmade greeting cards, creative tags, and scrapbook layouts!